Thank you for the email that was sent to Emerging Church leaders. It was helpful to hear from you. I am writing this as an open post – not because you need to respond to it [you dont] but because my apology to you should be public and i want to honor those that braved the pigeon-holing of Niebuhr’s Nauseating Culture Questionaire in order to give you a fair answer to your question (i am smiling as i write this). "This is why people like Len Sweet and other Emerging Church teachers are so dangerous. They cater to an evil mindset instead of attempting to change it through education in the Word. This is why we are living in the end times generation. The postmodern paradigm will bring in the reign of the Antichrist, Satan himself. We can only thank the Lord Jesus Christ that it will be short-lived and that the devil, the first postmodernist, will be put down forever." Another is "Emergent Church is Satan’s Deception" and a host of anti-emerging church sites like Slice of Laodicea (where i found your warning). No wonder Dr Greg Austin was inspired to write his own "Emerging Church – a response to our critics". But you did NOT accuse us of igniting Armageddon nor the Great Apostacy – far from it. The Baptist Press Warning and its proponents added a further level of angst and agitation that was not there and took your initial critique into territory that you probably never intended. As I end this series, I am attempting to answer your main concern (cultural captivity) and respond to your question regarding which of Niebuhr’s 5 ways to address culture would represent the approach of the emerging church. You need to know that most people in the emerging culture (call it "postmodern" if you like, but the word "complexity" comes first to my mind) are put off by simplistic, dualistic models of reality (we dare not trust the sweetest FRAME) but this suspicion of models should not be confused with a rejection of truth, or a casual approach to evil. – Kester, in the comments of No 5, says "Because Niebuhr appears to be putting forward a view of culture that is something we can choose to be a part of, a lifestyle choice. I’d disagree with that. Culture is not something we opt in or out of." BTW – I hope Kesters book on the emerging church (The Complex Christ) is also on your book list. Kester claims that the leading characteristic of emerging churches is the culture of gift-giving (and not Carson’s "protest" against the traditional church). He also explains emergent theory and its connection to emerging church. – Reformissionary – a good SBC emerging church discussion related to your paper on why the posture of Christ against culture, [although probably preferred by Moreland?? ], is under suspicion. – Emergent Kiwi says that "our models of gospel and culture are now unhelpful, as they so easily slide into either/or; if you are emerging you are culturally accomodating cf if you are non-emerging you are gospel faithful. The dualisms are easy but dead wrong." And we are not alone. Many others, much smarter than us, also have problems with Niebuhr. They say that Niebuhr’s approach from Christ and Culture (outlined here) is too individualistic (Guder), unpersuasive (Volf), too monolithic in its understanding of culture (Yoder). It is biased towards the transformative (Yoder, Hauerwas, Willimon, Gustafson), it is not historically accurate (Marsden) and it doesn’t answer which Christ? (Jenkins). It is a product of its time [its 50 years old] and near the end of its usefulness (Marsden) It is also unhelpfully "bi-polar" (Hunsberger) rather than a more accurate triangluation of the gospel message, culture and (the third factor) the CHURCH (Newbiggin). However, I realize that there are many scholars and theologians from a more modern background are asking the question "WHAT IF we were to subject the Emerging Church leaders and proponents to Niebuhr’s categories? How would they fare? 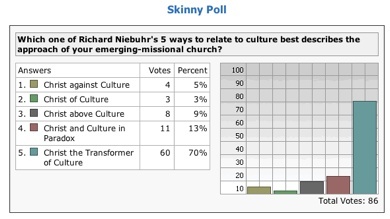 It was a lot of ask, and some of my readers may still be angry with me, but a few days ago I asked emerging church leaders to vote on one of Niebuhr’s 5 approaches to culture. 86 emerging churches responded and the results are here (click to enlarge). You can see that Christ the Transformer of Culture is by far the most popular choice, at 70% and Christ of Culture (accomodation/syncretism – what the emerging church is accused of) is actually the lowest at 3%. I hope that helps you in your research of the emerging church. – Because Christ as Transformer of Culture is a more holistic solution for a complex world, involving a prophetic response against the idols of culture coupled immediately with the redeeming, transforming power of the Gospel. – Because in our current church scene of culture-wars, angry fundamentalism, and segments of the church defining themselves solely by what they stand against, many of us feel that we should be identified by our transforming efforts, unity, fruit of the spirit and our love (by this will all men know you are my disciples). Anyway, much thanks, Dr Hammett for taking the time to critique us and to offer a challenge. I look forward to reading your future writings on this topic. Sincerely and respectfully, Andrew Jones. "the word "and" will be an often-used conjunction in the emerging church"
Hammett on the Emerging Church: Intro, 1, 2, 3, 4, 5, and this one which I think is the final. One of my problems with the Christ Against Culture vs. Christ Transforms Culture debate is that the Transformers (ha!) think that their view precludes culture wars. Those are sardonically relegated to those dopey fudamentalists who are always AGIANST the culture. I was one of the ten that voted for Against culture, because primarily of the Peterson quote in the article under review. I know it has been said before, but I still don’t understand the need to defend yourselves against all-comers. Ultimately your responsibility is not to Emergent-no or any of the others, it is to God alone. I think too much time is spent in returning fire, but that is probably just me. always a balance. I dont defend many of them, but every once in a while there is one where i feel a good connection with the author and feel a compulsion to claffy or get to the truth – because i know the critic is also interested in getting to the truth. and there are thousands of young people out there on the edge who’s support or reputation is on the line and i dont want them to lose face or funding because someone in another country (usually USA) said something about them without realising it. but you are right – we have to get on with the job. sometimes its best to take the pete rollins approach – be called a heretic (like Jesus) and live with it. I find people who have lived cross-culturally have a better understanding of “Christ the Transformer of Culture” than those who have never left their culture. Those who have seen the positive and negative effects of culture on culture…(media, music, style, MTV) BUT they also see the positive effect of Christ as a Culture Transformer. Sadly I’ve seen and met many “young people out there on the edge” (as you call them Andrew) leave… disillusioned about being a victim of “blue on blue” or “friendly fire” incidences… by well meaning people who don’t see the positive effects of Christ the Transformer of Culture. As a student of J.P. Moreland, I’m fairly certain that, contrary to your statement that he probably prefers the “Christ against culture” model, he is more of a “Christ as Transformer of Culture” kind of guy, and from what I can assess, his objection to the emerging church is that in its attempt to transform postmodern culture it has conceded too much to it in terms of its underlying philosophy. Additionally, “segments of the church defining themselves solely by what they stand against” captures what many of us who are not emerging perceive to be the case regarding the emerging church. While this description may not be fair from your point of view, this was definitely my first impression of the emerging church movement. Timbo – thanks for that clarification. I have only heard Moreland speak once – when i was a student at Western Seminary. I guess i was influenced by the post at Reformissionary (right here, actually) where, in the comments, Stuart says . ..
Great to hear another view. I dont know which of you are correct, but its good to have more evidence. Thanks for commenting. I think it depends on what is meant by “postmodernity” and how this differs from “postmodernism” as a philosophy. I know that Moreland thinks postmodernism as a philosophy is dangerous, but I don’t think that would preclude an approach of Christ transforming postmodernity (as a description of the culture) in so far as the elements of postmodernity which are incompatible with the truth of Jesus Christ would be transformed into something that is consistent with and brings glory to that truth. Thanks for this series, Andrew. I really enjoyed it. Sorry, kind of off the subject in a way, but this is what I’m currently writing a paper on. This is basically the thesis of the paper I am currently writing. The purpose of Niebuhr’s typology is not to pigeonhole anyone, but to examine the different approaches Christians have generally taken to this “enduring problem” as Niebuhr calls it. No individual (or community, etc.) is supposed to fit perfectly into a single category. Anyway, sorry to take up space defending the book. I just hate to see it get put down as total rubbish without any opinion to the contrary. I understand why people resist compartmentalization, but I also think there is still heuristic value in using this kind of typology, if only as a discussion starter. Thanks for the link and for sampling from my blog post. I have a chapter in my book (out of bounds church) on this question: relationship of emerging church to culture and it was a key question I explored in the my PhD study of the emerging church. I sort of cringed when I saw your poll. In the end, having read Neibuhr, I felt the categories no longer fitted either the practices of the emerging church, nor the culture we are now part of. In my out of bounds church book I suggest what I think is a better image: the DJ, who uses texts and can both amplify and subvert ie it’s multiple resources depending on the context and the fragment of culture one is faced with. So in the book I explore how the DJ is the most helpful way to understand both the EC and various parts of the Bible, and then what it means in practices for the mission of Jesus today. good example of complexity. thanks steve. love your book!!! and thanks bill – i will add “could be” to make it accurate. This discussion is making me want to rethink my thesis. I’ve got to get the paper done, though! Andrew – you write with grace and wisdom – thanks. Two things helped me greatly years ago. One was a question that I am sure many have heard: “Why do some who think so much of what God has revealed to them, think so little of what He has revealed to someone else?” The other was the best advice I have ever received. The context is too long, but the advice was, “Read Matthew, Mark, Luke, and John. Live like Jesus.” I won’t pretend to have lived like Jesus, but I have tried. And whether success or failure in that area, it is for certain that continual reading of the gospels as if they were short stories and not chapters and verses has revolutionized my Christology. There will always be critics. Go with God. maybe God is revealing stuff to our critics and we should listen more carefully and not be too quick to dismiss it when we think it is inaccurate.